Two decades ago, it was a historic occasion for sub-continent cricket. Sometimes, sports do not bring with them an air of relaxation. Though seen as a refuge where one seeks the easier and lighter things when life is too hard, the discipline itself can boomerang as tougher and traumatic. All sports offer such ruthless moments and cricket is no exception. On January 31, 1999, Indians learnt it by heart. Two decades ago, it was a historic occasion for sub-continent cricket. India were set to play Pakistan in a Test series and it was the first-ever since the series in Pakistan in 1989-90 and the first-ever on the Indian soil since Imran Khan’s side bagged a 1-0 win in 1986-87. The famous Lahore bus diplomacy was still some time away and so was the Kargil War. Cricket lovers on either side of the Wagah were looking forward eagerly to the two Asian powerhouses renewing their rivalry in the long format after almost a decade. Such moments did not come often. Led by the legendary Wasim Akram, Pakistan were to play a two-Test series besides a game of the first edition of the Asian Test Championship that was held that year. India, on the other hand, were captained by Mohammad Azharuddin and both teams had quite a few players who could dominate the game on their given days. 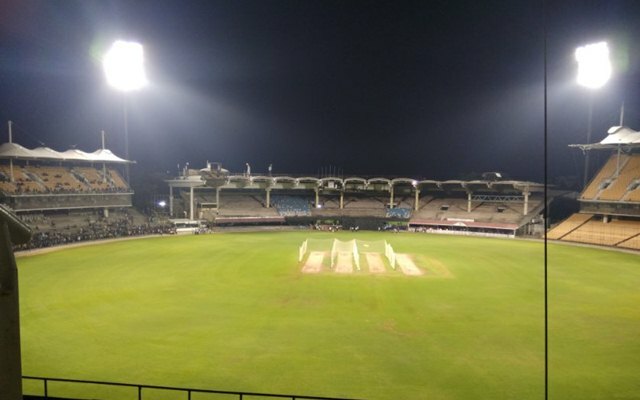 The first Test started at MA Chidambaram Stadium in Chennai on January 28. Akram won the toss and elected to bat and India did not delay in drawing the first blood. The visitors were reduced to 4 for 66 and then 5 for 91, thanks to the two old warhorses – Javagal Srinath and Anil Kumble – but then a couple of half centuries from Mohammad Yousuf (53) and the ever indomitable Moin Khan (60) ensured that Pakistan crossed the 200-run mark to give their famed fast bowlers something to defend. Skipper Akram also chipped in with 38 but Pakistan could not last full 80 overs and were all out for 238 inside Day 1. Kumble returned with 6 for 70 while Srinath took 3 for 63. Sachin Tendulkar had the remaining scalp. India ended the Day at 48 for no loss with debutant Sadagoppan Ramesh on 30 and VVS Laxman, who was an opener those days, on 18. The Indian fans were quite assured about the game’s direction though one could never trust the mindset of Pakistan bowlers. The second day clearly belonged to the visitors as they restricted the Indian batsmen. After the first wicket fell for 67, India lost the plot to dominate Pakistan and slumped to 188 for 7 at one stage, trailing by another 50 crucial runs. It was a 41-run partnership between Sourav Ganguly (54) and Sunil Joshi (25 not out) that helped India get closer to the Pakistani total though India eventually could manage a slender lead of 16 runs as they lost all their wickets for 254. Rahul Dravid (53) was the only other half-centurion of the Indian innings. Spinner Saqlain Mushtaq took 5 wickets for 94, including that of Tendulkar who fell for nought, while Shahid Afridi took three and Akram two. Pakistan ended Day 2 at 34 for 1, nullifying the lead that India had and on Day 3, they looked solid with the bat and marching towards a huge total to put the pressure back on India. Powered by a young Afridi’s 141, Pakistan were sitting pretty at 4 for 275 at one moment, taking their lead past 250. It was then when Venkatesh Prasad, who went wicketless in the first innings and had just one in the second till then, produced a miraculous spell. He ran through the rest of the Pakistani batting to see them collapsing dramatically. The visitors were all out for 286, losing their last six wickets in seven overs with Prasad ending with 6 for 33. India required 271 runs to win the game. Coming out to bat in the later part of Day 3, India were let down by their openers as pressure was building up. Waqar Younis, who did not get a wicket in the first innings, removed both Ramesh (5) and Laxman (zero in 15 balls) and it was all down to the middle-order to do the job. Tendulkar entered only to create a tragic tale that had left millions of fans traumatised. The Master Blaster started off with some exquisite touches as India ended the day on 40 for 2 with Dravid being the other batsman. Time was never a factor in this game but temperament was. The Indian batting order had to show its resilience against one of the world’s best bowling attacks and Tendulkar was leading the fight. 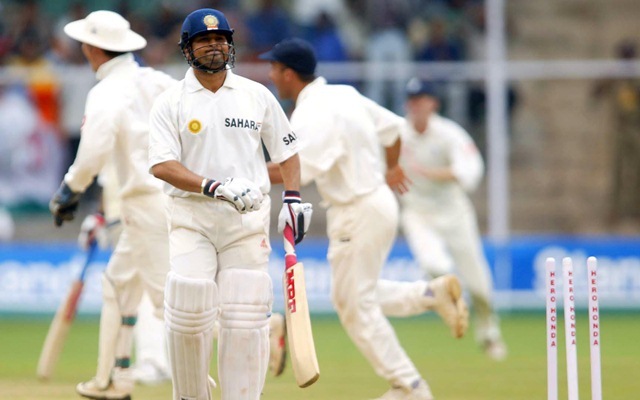 Dravid was bowled by Akram with a beauty in just the fourth over of Day 4 and Azharuddin (7) and Ganguly (2) didn’t last long although the latter fell victim to a grave umpiring decision as it was clearly seen that the ball bounced on the ground before being caught after he touched it. But these are part and parcel of the game and India could only look forward to a miracle from there on. 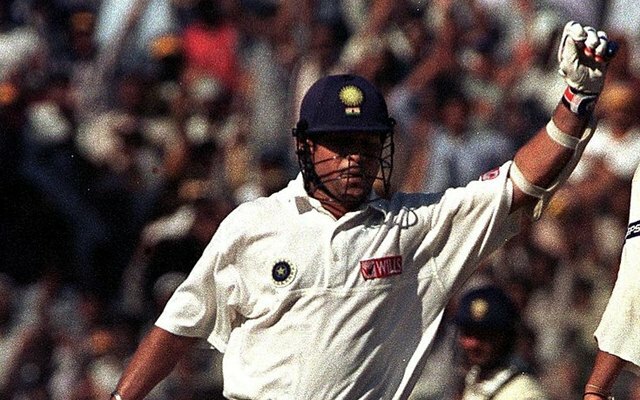 Wicketkeeper Nayan Mongia joined Tendulkar with India reeling at 82 for 5, needing another 189 runs to win. The partnership that followed was the highest point for India during the day. Slowly, the duo ensured their survival and then started going to the offensive. Tendulkar had a back strain during playing one of the shots and it certainly crippled his capacity to an extent but the genius in him kept on going. The partnership for the sixth wicket added 136 runs and it was another 53 runs when Mongia, who had just completed his fifty, committed hara-kiri off Akram’s bowling and the catch by Younis brought the climax to life again. Tendulkar, in the meanwhile, completed his 18th Test hundred and was opening up with his shots. He belted Saqlain for four fours in one over but also survived a scare as Moin missed a stumping chance off the same bowler. The seventh-wicket partnership also seemed solid as Tendulkar and Joshi added 36 runs and India now required just 17 runs with four wickets to go. Tendulkar had just hit two boundaries and then tried to hit Saqlain again over the top but a complete mistiming did him in. The doosra deceived the master batsman and the edge sent the ball high up only to be grabbed by Akram in the covers. The batsman, who fought all the odds and agony the whole day, had a long walk back to the pavilion amid the lengthening shadows at the MA Chidambaram Stadium as the Pakistanis sensed an imminent victory. His 136 off 273 balls that included 18 fours certainly reminded the fans the 96 that his predecessor Sunil Gavaskar had scored on a dust bowl in Bengaluru but yet could not see his team win. India had lost on that occasion by 16 runs – again a creepy semblance there. India theoretically still had hope with Joshi who had just hit a six but the pressure was far too high for the tail-enders to absorb. Joshi lobbed one back to Saqlain who picked his second fifer of the game by bowling Srinath as India’s final wicket. Kumble’s was the other wicket which was picked by Akram. A stunning silence prevailed on the ground as India were all out for 258, losing the match by 12 runs. But the crowd in Chennai did its bit by congratulating the Pakistan team and that was the only feel-good sign on a day that otherwise was of massive despair.